A Patio defines an inviting outdoor garden space which can provide the setting for a large gathering and entertaining space or a cozy, intimate space. The size, shape and location of this new space is designed to provide an attractive area, large enough to accomplish your objectives. This new space needs to complement and fit with the existing and desired new elements on your property. The existing grade and drainage patterns are also taken into consideration. The objective is to create a custom designed space which, when built, will look and feel as if it is an integral part of the setting. Patios can be versatile free-form outdoor living rooms. Organic shapes and materials with balanced earth-tones can create a contemporary outdoor garden area. Clean lines can develop a sophisticated space that invites you to relax with a glass of wine. Invite some friends and family over to spend some time enjoying the natural beauty of your backyard. 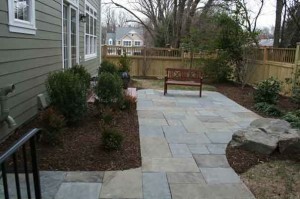 Patio surfaces can be constructed with many different elements and materials. A myriad of choices exists from different shades, shapes, colors and styles of hardscapes consisting of masonry units, brick pavers or natural stone. 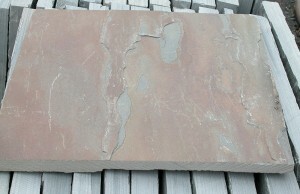 One of our favorite patio selections is full range Pennsylvania Bluestone with a natural cleft face. We often set this versatile stone in random rectangular patterns. The finished product, beautifully textured, has a carefully chosen blend of colors and shapes. The stones are expertly arranged so the colors and sizes do not repeat. The stone are usually placed close together, creating an attractive mosaic pattern..
Irregular shaped Pennsylvania Bluestone is used where a rustic and more natural look is desired. Large slabs are used, artfully arranged to create a sculptural pattern within the patio surface. The spaces between the stones can be grouted with coarse sand, bluestone dust, fine pebbles, polymeric sand, soil or mortar. 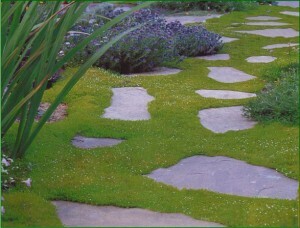 Small plants can also be planted within the spaces between the stone, creating unusual weathered look. 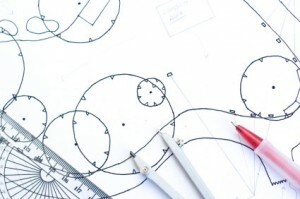 Drainage is an important consideration when designing your patio. Permeable pavers are a great choice where accumulating rainfall is a concern. Permeable pavers are set on a custom designed bed of sand and gravel. The permeable pavers are spaced to allow rain water to drain directly from the patio surface area instantly to the bed of sand below. The pavers used are normally concrete masonry units and are available in a wide variety of colors and styles. Trees, shrubs and flowering perennial plantings add definition and form. Trees and shrubs are used to create the walls and ceiling of your new patio garden room. Plant varieties are chosen with care to provide those which appeal to your tastes and add interest throughout the year. The plant combinations can vary widely. The plant enthusiast may wish to use a large selection of plants forming a rich tapestry of perennial and shrub plantings. Others may wish to opt for simple, elegant borders of evergreen shrubs and groundcovers. Water features add another highly sought after element in an outdoor garden areas. Water features are incredibly effective when built into the patio space or nestled alongside the patio. The soothing and calming effect of water is successfully used to create movement and add an additional dimension to your outdoor living room. Properly designed and constructed outdoor living spaces can be an exceptional draw to the outdoors. We love creating places to enjoy and participate in the outdoor environment, where the patio’s look and function changes with the each passing season.